Nothing is more important on a job than returning home safely at the end of the day. The Center for Educational Technologies® helps workers realize that goal through a couple of avenues. These materials, whether offered online or delivered in traditional classroom form, incorporate standards from the Occupational Safety and Health Administration and numerous other regulatory agencies. The materials include student and instructor manuals, corresponding slide shows, review questions, discussion questions, case studies, activities, and scenarios. 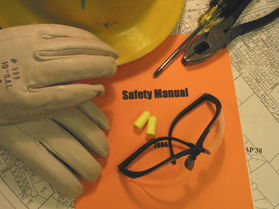 Another worker safety effort is the Mining and Industrial Safety Technology and Training Innovation project. It introduces new and existing technologies, training, and technology transfer approaches into the mining industry. The goal is safer mining. Through funding from the National Institute for Occupational Safety and Health, we are working with mining companies and the Mine Safety and Health Administration to develop innovative training that addresses mine safety.